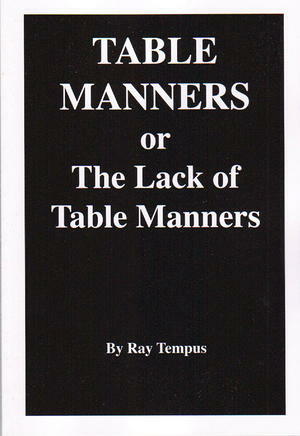 Table Manners or The Lack of Table Manners is the third book in the Ray Tempus Book Series. After years of witnessing people display terrible table manners, Tempus decided to do something about it: He wrote a book. In this very funny book, Ray Tempus states, "The idea here is to rid ourselves of beastly behavior like nose blowing and other awful things that happen at the table, be it home or out dining." The book gives the reader a lesson through words and illustrations of correct dining etiquette. Table Manners or The Lack of Table Manners will have people reevaluating how they eat at home and in restaurants. The book is so funny and informative it would have made Emily Post proud, while making her laugh.